For more than a century, Beverly was the county seat of Randolph County. Randolph County was formed from land taken from Harrison County in October 1786 by an Act of the Virginia General Assembly. The first court was held in the home of Benjamin Wilson located in Tygarts Valley. Colonel Wilson was a well-known Indian fighter and Revolutionary War soldier. The new county was named for the Governor of Virginia, Edmund Jennings Randolph, who served from 1786 to 1788. Randolph County was and is the largest county in the state. Randolph County has ten magisterial districts: Beverly; Dry Fork; Huttonsville, Leadsville; Middle Fork; Mingo; New Interest; Roaring Creek; Valley Bend; and Whitmer. The current county encompasses 1,080 square miles; this decrease over its original size was due to parts of the original county being taken for the formation of other counties. It is composed of several parallel mountain ranges with intervening valleys and watersheds. The population of the county in 1830 was 5,000 persons; in 1870 it was 5,563; in 1880, 8,102; in 1890, 11, 633; in 1900, 17,670; in 1910, 26,028; and in 1920 it was 26,804. Two of the earliest settlement families in the Beverly area were the Robert Files and David Tygart families in 1753. The Files family settled where Files Creek meets the Tygart Valley River and built a log cabin. The Tygart family located a short distance up the valley. In the fall of 1754 a Files boy returned home to find his family being killed by Native Americans and the home place being burned. He fled to the Tygart's home and the pioneers fled. For the duration of the French and Indian wars no other settlers arrived in the area. By 1768 some settlers returned but they were few. In 1772, Captain Benjamin Wilson led a group to the Beverly area and they built forts for protection from the Native Americans. Wilson was a famous Indian fighter and Revolutionary War soldier. He lived and built a fort three miles south of present day Elkins. Wilson assisted in the building of three forts. This second settlement wave consisted of nine families: the Westfalls; the Stalnakers; the Butlers; the Whitmans; the Connelys; the Nelsons; the Riggles; the Haddens; and the Morgans. Jacob Westfall Sr.'s fort was built in 1772 near the Files home site. Jacob Sr. came to Randolph County from Hampshire County where he had had a farm. Jacob Sr. and his wife, Judith, had five sons and three daughters. The Westfalls found and buried the bones of the Files family. Jacob Westfall Jr. was the first Sheriff of Randolph County. Daniel Westfall was a member of the first grand jury of the new county and John Westfall was-the first county clerk. Jacob Westfall, son of John Sr. was the second county clerk and Cornelius Westfall Jr. as the second Sheriff. 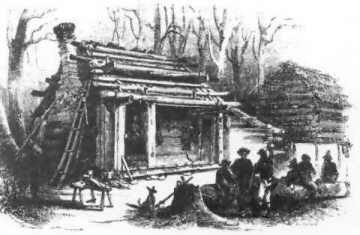 Several of the log homes built by these early pioneers are extant within the configuration of current buildings. The first session of the court of the county was held at the home of Colonel Wilson on Chenoweth Creek on May 29, 1787. At this session a town and court house were planned on James Westfall's land and he was authorized to lay the town out in lots. The likely county seat was first named Edmunton, in honor of Edmund Jennings Randolph, the governor of Virginia. Randolph County was also named in his honor. Plans were made at this time for the construction of a jail and a court house. 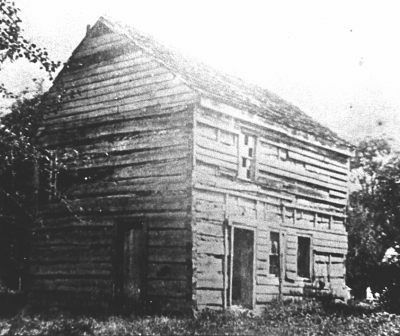 The log home of James Westfall was used as the first county court house. In 1790, a twenty acre plat owned by James Westfall was laid out in one-half acre lots. Each lot was to be sold for five pounds ($16.67). The buyer had to agree to build a house at least sixteen feet square with a masonry chimney within five years of the purchase date or the lot would be resold by the town's trustees. The town trustees in 1790 were Hezekiah Rosencrantz, Valentine Stalnaker, Thomas Phillips, John Wilson, Sylvester Ward, Jacob Westfall and William Wamsley. The twenty-acre town plat included the just completed jail, the log courthouse under construction and the log school house. Prior to the completion of the first jail building, prisoners were housed at the home of the Sheriff. The log schoolhouse was already in use by 1787. By 1787, the town was renamed Beverly. The town of Beverly was chartered in 1790. James Westfall collected the annual rents on the town lots until he sold the property to William Currence in 1793. Currence was supposed to have collected these rents but it is unknown as to whether or not he did and eventually the rent provision was abandoned.